-- A parodic holiday created in 1995 by John Baur (Ol' Chumbucket) and Mark Summers (Cap'n Slappy), of Albany, Oregon, U.S., who proclaimed September 19 each year as the day when everyone in the world should talk like a pirate. Greet your friends not with Hello, everyone! but with Ahoy, maties! or Ahoy, me hearties! -- Would you like to talk like a pirate? Arrr! Read this book and learn to talk like a pirate the easy way. 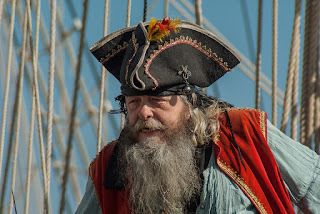 This handy guide to pirate talk combines fact, fiction, and a lot of fun, with over 450 pirate and nautical terms - plus a Quick-Start Guide - so you'll be talking like a pirate in minutes. The pirate talk definitions are loaded with fascinating tips and trivia. From weird trivia to fascinating facts, this is an ideal mix of history and vocabulary. • Backyardigans Sing and Pretend Pirate Pablo -- Perfect for your little one! Dressed as a pirate, complete with pirate hat and peg leg. Squeeze his tummy and Pablo either talks like a pirate, sings a pirate song or plays reggae music. • Pirate Telescope -- A pirate telescope is a great costume accessory to any pirate costume. The pirate telescope is life-like and actually extends and collapses like a real telescope. • Blackbeard's Queen Anne's Revenge -- Release your inner pirate with this adorable tall ship model of the Queen Anne's Revenge, captained by the infamous Blackbeard! Handcrafted out of the finest woods, this miniature boat rests easily upon any desk or shelf. Add a touch of pirate decor and adventurous spirit to any office or room with this classic pirate ship model. • What's Your Pirate Name? • Pirate Resources for Talk Like a Pirate Day! - a light and dark orange striped worm, the pet and friend of Oscar the Grouch on Jim Henson's Muppet show Sesame Street. - can you remember the last time you had butterscotch pudding? Well, today's a good day to have some! - Adam West (born September 19, 1928) is an American actor best known for his lead role in the 1960s TV series Batman and the film of the same name. -- Join AOTA and occupational therapy practitioners, educators, and students across the country as we help others avoid the pain and injury that can come from heavy backpacks and bags. Students, parents, educators, school administrators, and community members learn safety tips to stay protected from back pain throughout life.